We have many designs of cycle shelters. Our original cycle shelters, traditional shelters and more contemporary designs. All designs will deliver practical storage of bicycles and motorbikes while complementing and enhancing their environment. We also offer a range of finishes and colours to suit your environment and colour schemes. Our cycle shelters have a host of practical features that make them an ideal choice for cycle parking in busy areas such as schools, colleges and campuses or anywhere. We offer cycling shelters and ancillary products to suit every budget which are designed to be complimentary to, and work well with other manufactures shelters. 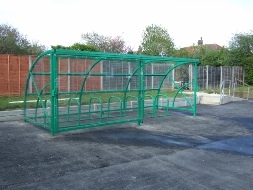 Many of our cycle shelters are of modular construction. They are designed to be complimentary to each other and can form high security compounds. Our most popular design of cycle shelters, The Trent shelter is designed to deliver practical storage of bicycles and motorbikes while complementing and enhancing its environment. Our shelters have a wide variety of practical features that make it an ideal choice for cycle parking in busy areas such as schools, colleges and campuses. We also manufacture and supply Walkways, Canopies, Benches, Litter Bins, Bollards and many other aspects of Street Furniture. Cycling is increasing in popularity. We offer a large range of cycle shelters, compounds and security retaining systems to meet this need. 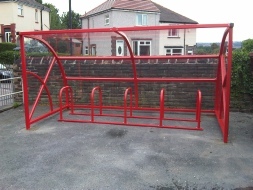 We can reduce bike thefts and vandalism on your site by installing cycle storage equipement and furniture. The tough, scratch-resistant polycarbonate roof is clear in order to maximize visibility in and around the cycle shelter, at the same time it protect users and cycles from the elements. A single bike rack will secure 10 cycles and can be extended in its length . Because our flexible modular design allows it, you can extend your cycle accommodation at any time. Our bike facilities are designed with modern cycles and security in mind. These storage shelters come with either a clear or solid back and side panels or a combination of both, allowing visibility and security where required. Type of usage :short stay (few minutes to a couple of hours ) Visitors, customers and people making deliveries typically use short-term parking. It has a higher turnover rate, and needs to be conveniently located and requires a lower level of security.